Seahawks Family Photos - for Yakima's biggest fans!! 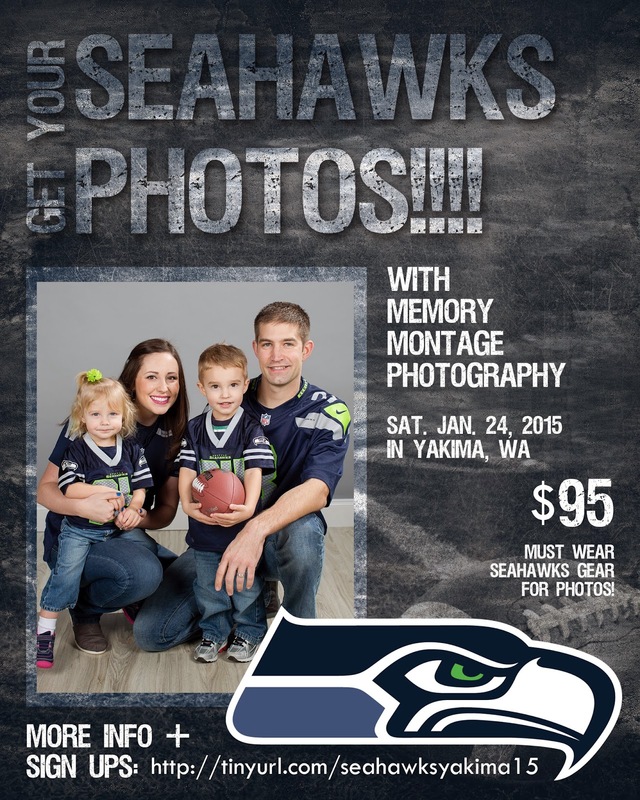 Show your Seahawks pride and get some fun family photos to celebrate and commemorate Super Bowl XLIX! Why: because we love our Seahawks!! The $95 session fee includes a quick indoor session for up to 6 people, 3 poses/combinations, AND 5 digital files for printing up to 5x7. Additional prints and products are available separately for purchase. 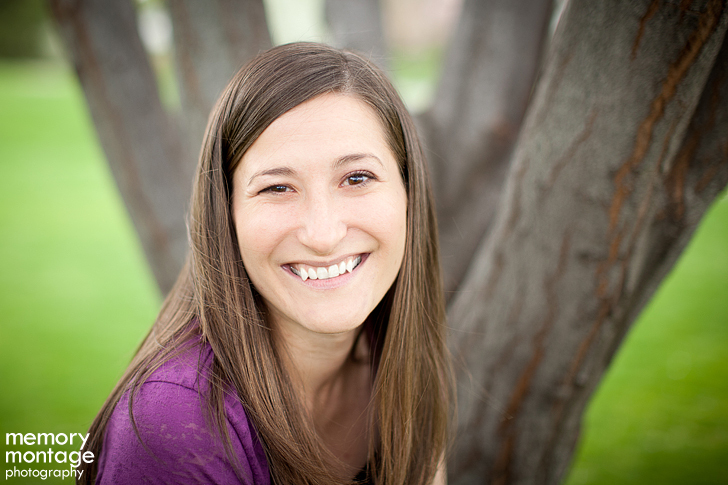 Q: During the mini session, can we do both family shots and individual shots of the kids? A: Yes! Three poses could be 1) group photo 2) just kids 3) just parents, etc. Q: Can we have this offer on a different day? A: No, we are only offering it for one day. Q: Do we have to wear Seahawks gear for this offer? A: Yes, everyone must be supporting something on them or just wearing Seahawks colors. Q: What if we want to order prints? A: You will have the opportunity to see the photos and order prints online. If you order that same day we can have the items delivered to you in time for the Super Bowl. Q: What happens if my kids are fussy the whole time? A: We do our best to get and keep the kids happy during the session, but there's always a possibility that the kids won't want to cooperate. We will still photograph you and your kids during the session and give you the best 5 images. A: No, unfortunately we are photographing indoor only and cannot bring in pets. Session Fee: The session fee is required to reserve a timeslot. If you cancel, the session fee is non-refundable but you can gift your session to someone else. If you would like to change times, you may request to change up to 5 days before the shoot, based on our availability. If something comes up last minute, you can gift it to another family of 6 people or less to take your place. Online Gallery: The online gallery of images will be available for two months after the date it is posted. Print Orders: The session fee does not include any prints. All prints and products must be ordered separately. Model Release: We reserve the right to display any photographs taken in conjunction with this session as samples of our work for the purposes of advertising. This includes promotion on the internet. Public Usage of Photos: If you post or publish your photos publicly (electronically or in print) it must be cited as the work of Memory Montage Photography. This includes Facebook, magazines, photo contests, etc. You may not edit, modify or create derivative works of the copyrighted photos. This family session was photographed out in the Naches area. This couple loves the outdoors and we found some beautiful locations. We had the opportunity to photograph their wedding in 2010 and it was a treat to photograph this session for them as they celebrated the coming addition to their family. Tavis and Amy are close friends with this couple and both couples are excited to see their sons grow up together. Their son Hadden was just born last month! Congratulations Kramer family! Now accepting applications!! This summer we have an internship position available to work alongside Memory Montage Photography. 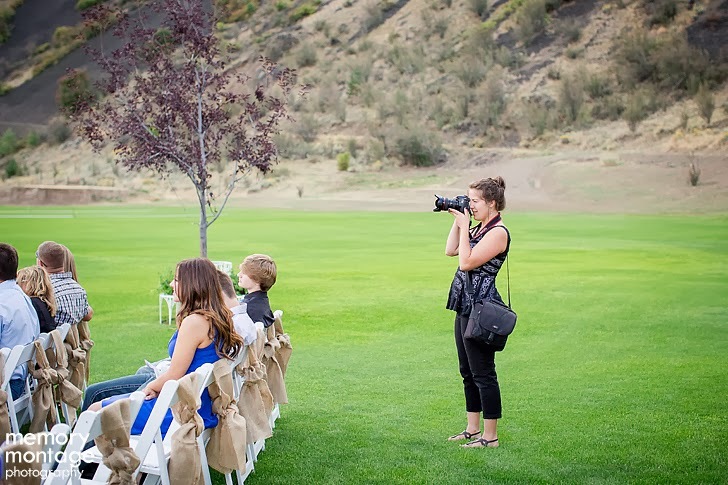 Summer internships are designed to give practical experience in photographing weddings as well as useful business knowledge. Interns finish the summer with a better idea of what it takes to find success in this high-stress industry. 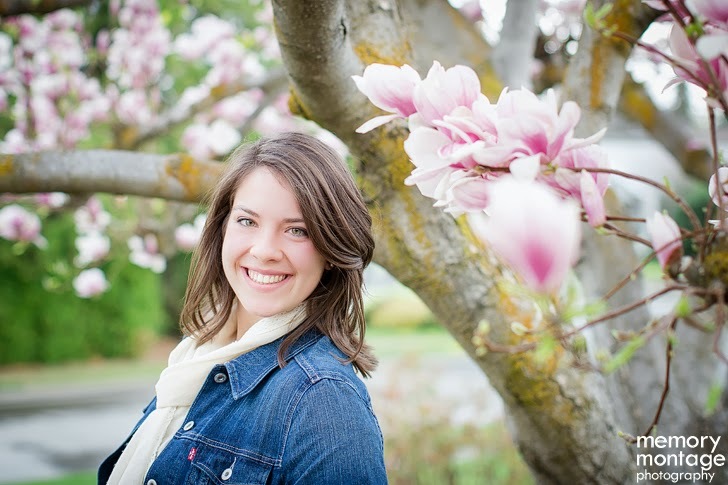 Other opportunities include senior and family photography as jobs present themselves over the internship season. 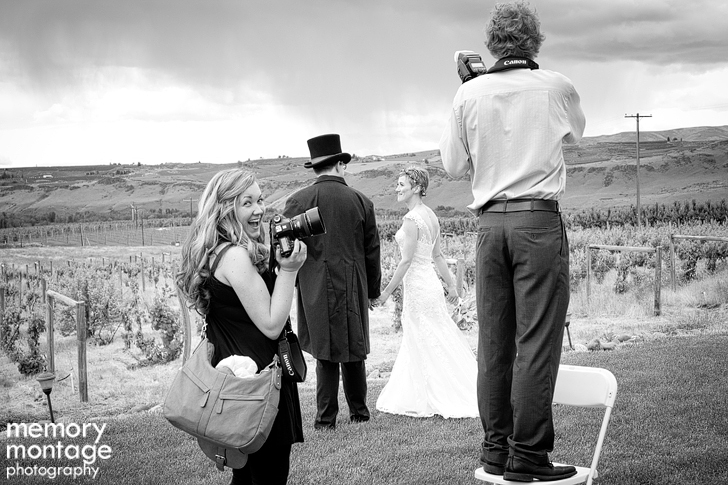 Each Saturday you will come along with one of our photography teams shooting a wedding. 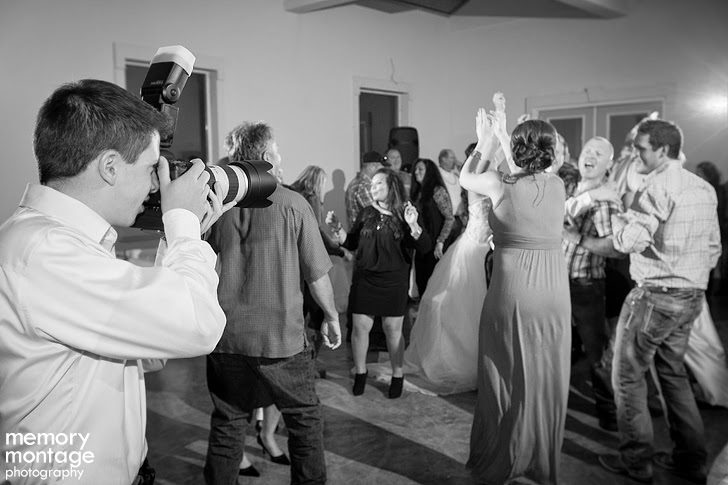 You will see our camera settings, client interaction, posing, lighting, and the flow of a wedding day. Only a small portion of running a photography business is shooting... the biggest part is client interaction and directing a session! 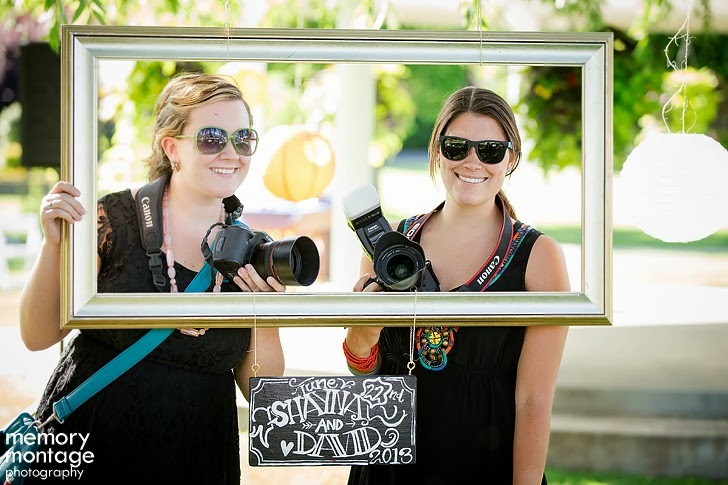 You will represent Memory Montage Photography and be referred to as our photography assistant on wedding days. Your assisting duties include but are not limited to: carrying a few things, running mini errands, watching for details, and also snapping a few photos. As a thank you we will gift you a registration to our photography essentials class, as well as answer your questions about photography and business throughout the summer! To apply for this position, click here. A: The deadline to apply is March 31, 2015. The application must be submitted by that date in order to be considered. Q: How many interns do you take on per summer? A: We will be accepting 1-2 interns. Q: When and how will you make your decision? A: The first week of April we will review all of the applications and start narrowing down the best fit based on the application, references, and availability. Q: For whom is the internship designed? A: The internship is designed for creative individuals who have experience in graphic design and/or photography and are interested in working with a successful wedding photography business for the summer. Q: What is the commitment timeline? A: The commitment timeline is to attend 10-15 weddings between April-October 2015. Q: How many hours per week? A: 8 hours on Saturdays, along with optional hours on other days depending upon scheduled events. The summer internship is a serious commitment. We will count on you to attend 10-15 weddings! If there are Saturdays you are unavailable, we are happy to accommodate if scheduled in advance. The weddings you would like to attend will be scheduled together with me at the start of the internship. Q: Where will the weddings be? 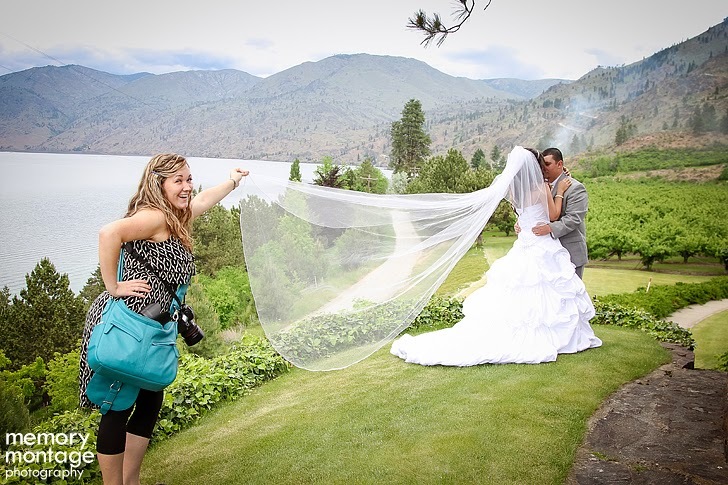 A: We have several weddings in the Yakima area, but others are all over the state. It's your choice which 10-15 weddings you want to commit to. 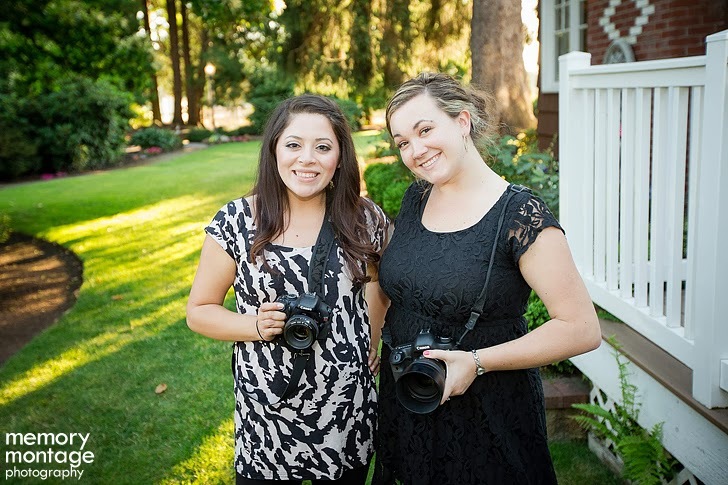 Q: Is this photography internship only for Yakima area? A: No, this internship is open to anyone in Washington state. The initial meeting is to go over the details of the internship duties and put dates on the calendar, and this can be done in person at our studio in Yakima, or over skype if our intern lives out of town! Otherwise, they can just meet us at each wedding! Q: What qualifies someone for eligibility? A: Applicants must have a passion for wedding photography, and a desire to learn. They must also have a digital SLR camera. Q: Is there a stipend? A: No, this is an unpaid internship designed to give beginner photographers more experience in the field. Q: Can I participate in the Summer Internship and still work another job or attend summer school? A: Yes of course! We just need a commitment from you on the 10-15 Saturdays that we decide on. Q: I have another commitment during the summer and will not be able to complete the entire April - October commitment. Am I eligible? A: If you are unable to commit to the entire wedding season, the reason must be stated in the application. We will review that and consider your information when making selections. Q: I am unavailable most Saturdays this summer, could I just come along to a couple of weddings without being an intern? A: Coming to weddings with us is an experience we usually reserve for interns only. We work a lot with interns before and after the wedding answering questions, going over wedding etiquette, preferences, and talking about the couple, as they are assisting us and directly representing our business. This is why it's exclusively for 1-2 interns per summer so that we are all on the same page, and we can give our full time and attention with that intern without being spread too thin. Q: I want to apply, but the March 31st deadline has passed. Can I still apply? A: Contact the studio: info@memorymp.com for internship status. If you're interested in working and learning with us but the internship is not for you, we also offer photography workshops and mentoring sessions throughout the year. Find more info here. “Working with Memory Montage was an endearing experience. Bottom line: MMP is the best! It’s often difficult to find people who are willing to teach, let alone finding people who allow you to follow their every move and pelt them with questions, which they gladly answer. 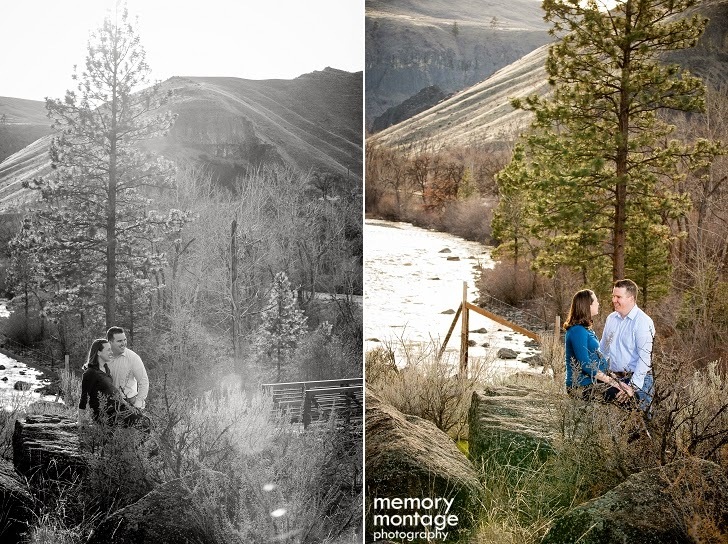 The people at Memory Montage are generous with their time, talents, knowledge and experience and are interested in helping you succeed as a photographer. I’ve often been amazed by how freely they share information and by how sincerely they care about people. I can’t even begin to tell you how much fun I had during the 2013 wedding season as I learned from Tavis, Amy, Rhiann and Haley. By the end of most wedding days, my feet were sore, my head was spinning as I tried to digest the new skills I’d attained, and my stomach was sore from all of the laughter. (: In all honesty, working with Memory Montage was one of the most rewarding and joyful experiences of my year. I love the people, I love what they do, I love how they conduct business and I love how they serve their clients with excellence. They not only create vibrant and fun photography, they themselves are vibrant and fun! I couldn’t recommend anyone more highly than Memory Montage Photography. I only have good things to say about them and their internship program. They’re the best! Seriously, these people are amazing. (:"
"I first want to say thank you to amy and Tavis for choosing me to be one of their interns this summer. I only went to 4 weddings but i learned so much from those 4. 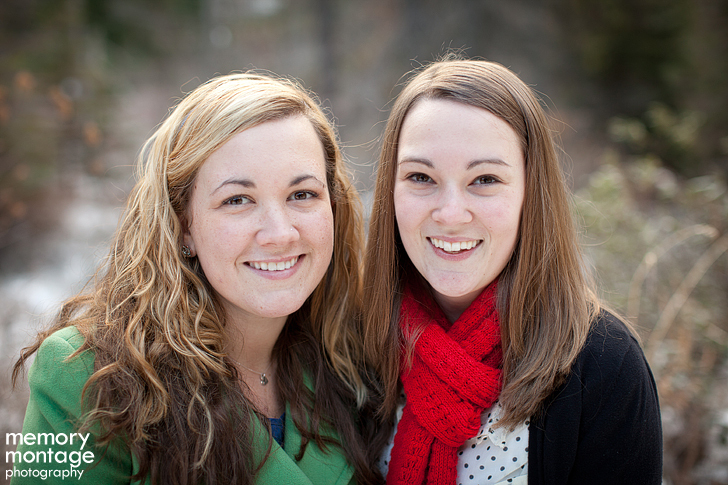 Amy & Tavis, as well as Rhiann and Haley, were always answering any questions I had. I learned about lighting and interacting with clients and posing as well as many other things. Everyone at MMP are such a blessing! They love to teach and they love their clients. My only regret is not being able to live closer and attend more weddings! ;) My advice for the next intern is to definitely take advantage of every second with MMP, whether it's for only 4 weddings or the whole summer. 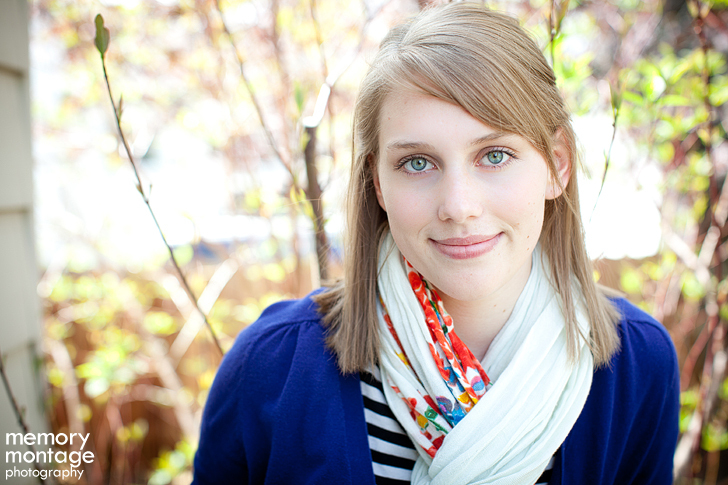 I walked away refreshed and excited about my photography business!" "I had the opportunity to intern with MMP this summer and I am extremely thankful that I was able to fit it into my schedule. I applied to intern with MMP because I knew they were dedicated to teaching their interns and they did exactly that plus more. 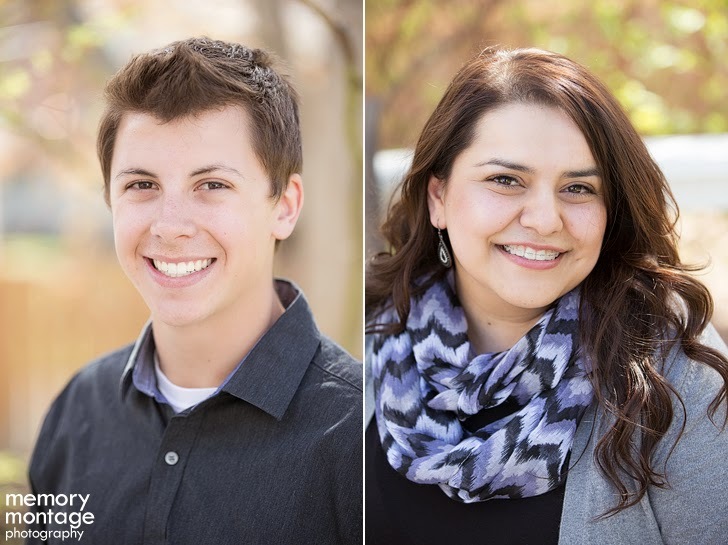 Tavis and Amy are very successful in the photography business because of their professionalism, knowledge and ability to connect with their clients. All of these aspects were areas I wanted to learn more about as I started my business; specifically, the wedding industry. In the fast upbeat day of a wedding there are a lot of situations to consider and timelines to follow along with the vast majority of people you interact with throughout the day. I was able to learn a lot about what to do when adversity is thrown into the mix of a wedding day along with various scenarios I wouldn’t think of. All in all, Tavis and Amy handle everything with great enthusiasm and professionalism to make the day less stressful and provide flow to an already hectic day; and to also mention, are so fun! In addition with being able to see first-hand how they interact and work, I was also able to do a lot of hands on work which really helped my growth. Both do a fantastic job of providing immediate feedback and answering questions you may have in a timely matter, which allows for quick learning. Not only did I have an amazing experience with MMP, but I was also able to build a relationship with Tavis and Amy that will last a lifetime. Thank you so much for everything you two have helped me with; I literally do not know what I would have done if I didn’t have you as a resource!!" "During the summer of 2009 I did an internship with Tavis and Amy, and learned more than I ever thought I could know about photography. Over the course of the summer I got to become familiar with equipment that I had never used before, and learn through hands-on experience how to be intentional with my shots using the the manual settings on the camera. I really came to understand the flow of a wedding day, and taking on responsibilities of the job. From watching, listening, and observing the way Tavis and Amy operate, I was able to pick up on their style, and the things they do to get the most they can out of their pictures. My overall experience was great, and so beneficial to me in expanding my knowledge in photography. It was a fun and exciting way for me to get exactly the kind of experience I needed to help me grow as a photographer"